The Student Evaluation of Instruction (SEI) has been updated to a new platform. Blue, from Explorance Inc., is used throughout higher education across the world to evaluate, analyze, and improve the student learning experience. Access your SEI information, reports, and response rates from Carmen. Students can complete the SEI in Carmen, as well. Just an easy click away in Carmen or here. More data available in an improved format. View more information at SEI Reporting. The SEI consists of the same 10 questions. Optional comments will be turned "on" for all instructors. Read more about disabling your comments, if preferred. Same process is in place for which classes are or are not excluded. Over 75% of students in Spring 2018 used the OSU Mobile App for SEI submissions. There are no changes in the app. SEI response rates increased from 29% to 46%. The Carmen integration made access to SEIs much easier for students. Comments will be "on" by default moving forward. Due to some new functionality in Blue and based on feedback, we have changed comments to work the way they used to. Classes and Instructors Using Online SEIs for Current Term. Although the process for administering SEIs will be similar, there are a few important changes to keep in mind. Note: there are no changes to the content of the SEI, itself. - Comments are "on" by default. This is the same as Spring 2018, but different from the Summer SEI pilot. - Posting a grade no longer immediately shuts off student access to the SEI. Access will now shut off overnight. - SEI access will now be in Carmen, as well as the Faculty Center and Buckeye Link. You must disable comments before the SEI is open to students to complete. Read more about disabling your comments, if preferred. View the Important SEI Dates above to learn when your SEI will open. Previously when a grade was posted for a student, that student immediately lost access to complete the SEI. This is changing and access will now be removed overnight. In order to maximize response rates, instructors should wait until the final exam period begins to post grades. - SEI Management: to turn comments off. - SEI Response Rates: view real-time response rates. - SEI Reports: link to reports when available. Reminder: If you assign a grade to a student, access to the SEI will be removed for that student overnight. Once removed, the student can no longer complete an SEI. - Comments: Comments are turned on by default. You can disable comments if you do not want them as a part of your SEI. - Opt In or Opt Out: Email at seiadmin@osu.edu with the following information: name.#; subject and course number (ex. History 1100); the 4- or 5-digit class number. If opting out of SEIs, you must provide the reason your SEI is not needed, and you must copy your department chair, director, or course coordinator. - Remove Multiple//Redundant Components: Email seiadmin@osu.edu with the following information: name.#; subject and course number (ex. History 1100); and the 4- or 5-digit class number of the classes to be removed. 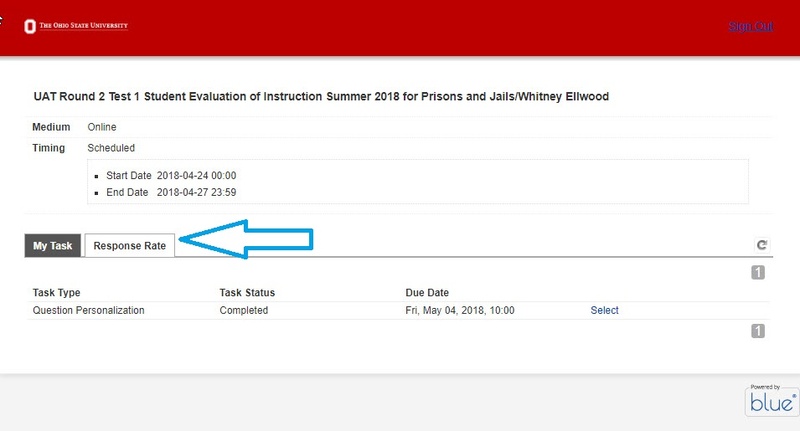 - Delay Activation: Email seiadmin@osu.edu with the following information: name.#; subject and course number (ex. History 1100); and the 4- or 5-digit class number and the date you want the SEI to become available. Please Note: all instructors for a course will have the same activation date. You must allow at least 5 active SEI days. The deactivation date cannot be changed. The Scheduling Office in the University Registrar's office has developed a guide to explain SEI setup in the Class Schedule and its relation to Carmen. Work with your Department Scheduler to address issues or concerns. The University Faculty Rules, 3335-3-35 (C)(4), stipulates that a student be given the opportunity to evaluate the quality of instruction provided in each course. The Student Evaluation of Instruction (SEI) was developed as the official, university-wide instrument for this purpose. The SEI consists of ten questions, along with optional comments. It is administered electronically via the OSU Mobile App, Carmen, or Buckeye Link. Learn more about SEIs at Ohio State in the SEI Handbook. View a sample SEI to learn more about wording and questions asked. Note: SEIs are automatically generated for all instructors, with the following exceptions. - Catalog Number (course) is x999 or x998 or ends in xx93. - Class Component is Independent Study (IND) or Field Experience (FLD). - Those listed with an Instructor Role of GRDR-N-SEI for the course. - Individuals whose names are marked not to print on the Schedule of Classes. SEIs are activated when 90% of the class is over. Instructors may delay their activation date as long as it allows students at least five days to respond to the SEI. All instructors for a class must use the same activation date. The SEI deactivation date is always the last day before final exams begin (the reading day). Posting a grade for a student will cause student access to the SEI to end overnight. The SEI deactivation date is set in accordance with the Academic Calendar, and cannot be modified. In the Student Information System (SIS), one class may have multiple meeting patterns, each with its own start and end dates. The interval used to compute the default activation date for SEI spans the earliest of all the start dates listed for the class number, to the latest end date listed for that class number. For example, if one meeting pattern for the class runs from October 1 through November 30, and another meeting pattern for that same class runs from September 15 through November 15, the 90% computation for activating SEIs would be based on the interval from September 15 (the earliest start date) to November 30 (the latest end date). Classes with atypical schedules can result in a default activation date occurring after SEIs close for the term. In these rare cases, the SEI instrument cannot be used and a different alternative must be sought.